Status: Rare casual spring migrant statewide. Accidental in summer and fall. Documentation: Photograph: 26 May-1 Jun 1982 Niobrara Valley Preserve, Brown Co (Brogie and Mossman 1983, Bray et al 1986). Taxonomy: Two subspecies are recognized (Pyle 1997): discolor, breeding and wintering in most of the North American range, and paludicola, resident in coastal south Florida. Nebraska birds are presumed discolor. 18 May 1996 Fontenelle Forest, Sarpy Co (Brogie 1997). An additional report, probably correct, was of one singing and thought to be this species but not seen at Brady, Lincoln Co 5 May 2009; another, also heard only, was at Boyer Chute NWR, Washington Co 18 May 2018. An additional five older reports are unaccompanied by any details. Summer: The only record is of a singing male at NNF Bessey, Thomas Co, 5 Jul 1997 (Brogie 1998). Bruner et al (1904) cited several reports from the 19th century by Aughey and others, including two of nesting, one in Dakota Co and the other in Richardson Co, accepted by Dunn and Garrett (1997); Aughey (1878) considered it “abundant” in eastern Nebraska, and Taylor (1888) referred to it as a “Summer resident; common” in southeast Nebraska. Although some of these early reports have been questioned (Johnsgard 1979, 1980; Sharpe 1993), Wayne Mollhoff (pers. comm.) pointed out that as the forests were cleared, brushy habitat became more common, albeit often ephemeral, which would have contributed to an increase in numbers of Prairie Warbler. The existence of these old breeding records for this species and also for Blue-winged Warbler, both of which occupy similar habitat which has since largely disappeared from Nebraska, is intriguing. 6 Sep 1998 immature male Gering Cemetery, Scotts Bluff Co (Brogie 1999). Additional undocumented reports are 31 Aug 2002 Fontenelle Forest, 22 Sep 1983 Douglas-Sarpy Cos (Williams 1984), and 23 Sep 1972 McPherson Co. 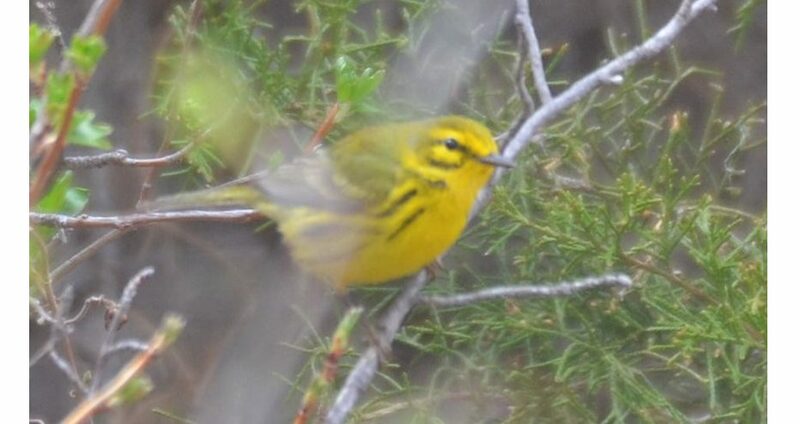 Photograph (top) of a Prairie Warbler at Lake McConaughy SRA, Keith Co 30 Apr 2018 by Caleb Strand. Aughey, S. 1878. Notes on the nature of the food of the birds of Nebraska. 1878 Report of the United States Entomological Commission. Government Printing Office, Washington, D.C:, USA. Cortelyou, R.G. 1979. 1979 (Fifty-fourth) Spring Migration and Occurrence Report. NBR 47: 42-54. Grzybowski, J.A. 1991. Southern Great Plains Region. American Birds 45: 466-469. Taylor, W.E. 1888. A catalogue of Nebraska birds arranged according to the Checklist of the American Ornithological Union. Annual Report of the Nebraska State Board of Agriculture for the year Nebraska: State Journal Company, Lincoln, Nebraska, USA. Williams, F. 1974. Southern Great Plains Region. American Birds 28: 918-922. Williams, F. 1978. Southern Great Plains Region. American Birds 32: 1024-1028.